The Wilderness Society held a special event on 5 June 2012, World Environment Day. It was big – 1 hectare in fact. All were invited to come and join in the action to celebrate the beautiful gems that are our wild places, and shed light on some of the risks they face. 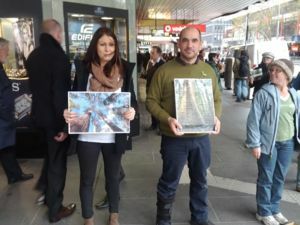 Hundreds of people joined hands around one of Melbourne CBD’s 1 hectare city blocks on World Environment Day as a representation of the threat to our forests, oceans and wild places from logging, unsustainable fishing and mining. What’s in a city block? And in a once in a lifetime opportunity, the equivalent to 108,000,000 city blocks of our marine territory is up for protection in 2012! Hundreds of Victorians joined hands on the United Nations’ 12th World Environment Day to show support for Australia’s world renowned natural environment. This page was last modified 12:12, 5 June 2012.